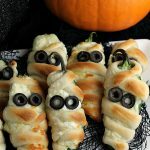 These Low Carb Mummy Poppers look just like mummies – and are the perfect spooky dish for a Halloween party! It's low carb and keto diet friendly. Place the prepared jalapeños on a baking tray lined with a silicone mat. Mix the cream cheese and shredded cheese together in a bowl, then spoon it into the cavities of the jalapeños. Cut each tortilla into 8-10 narrow strips, then wind two strips around each jalapeño half. Bake for 8 minutes or until the cheese starts to turn brown. Serve warm, with added googly eyes (if using).